Within UBC’s overall program in art education, is a faculty commitment to ongoing in–service for art teachers. Whenever possible, practicing teachers are encouraged to upgrade their expertise and qualifications by returning to UBC for additional courses. Students enrolled in the Art Education diploma must complete 18 credits of courses in art education at the 300/400 level, with the remaining 12 credits chosen from any 300/400 level approved courses in the Faculties of Arts and/or Education. For course approval, please contact Dr. Lorrie Miller in the Teacher Education Office. For specific program information, please contact the Department Advisor, Dr. Donal O Donoghue. 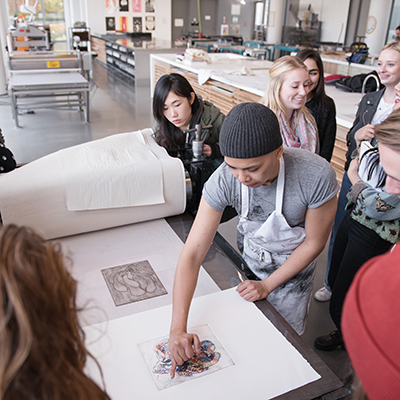 The two courses listed above illustrate the collegial relationship between the Visual Arts program and the Art Education program. These courses are also open to fine arts students wishing to explore ceramics and textile design, both of which are unavailable to them in the Visual Arts Department in the Arts Faculty. For approval of electives, please contact a teacher education program coordinator. For approval to enroll in a 500-level graduate course as part of the Diploma credits, please contact the department advisor with copy of approval emailed to the teacher education program coordinator.